Produced on the banks of the Piscataquis River on the very spot where Milo’s first settlers came, this big out door spectacle of 600 people will portray the history and life of the Community for 100 years. The Pageant will consits of 10 episodes intersperesed with singing and symbolic dancing. Several hundred maidens picturesquily costumed in nature’s own colors will add grace and beauty to the big performance. A 15 piece orchestra under the direction of Prof. K.A. Ringwall of Bangor will be another feature. Penobscot Indians from Indian Island, Old Town, will take part in the big Prologue. the victor of the day. Golden trumpeted heralds announce the coming of Father Time and his massive book of 100 years. From out its weather-beaten pages comes the SPIRIT OF THE THREE RIVERS. She calls the Pines, Birches, and Poplars, then the Spring Flowers and rushing through them flow the THREE RIVERS on their way to the Sea — but lo, on the waters of the Piscataquis move birch canoes and the Penobscot Indians are making their yearly fishing and hunting trip. A shot is heard and the white MAN enters this unmolested domain of the wild for the first time. SCENE 1. Moses and Stephen Snow arrive from Belgrade. SCENE 2. At the same time Benjamin Sargent and his son Theophilus from Metheun, Mass., pole up the river in a bateau. 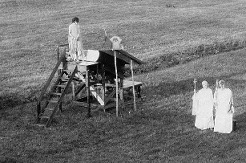 SCENE 3. Six months later Benjamin Sargent starts for Massachusetts, leaving his 14 year old son with the dog, Hunter, alone in the wilds for six months. Meeting Of the early settlers at Foxcroft to discuss plans for their protection against Indian invasion. 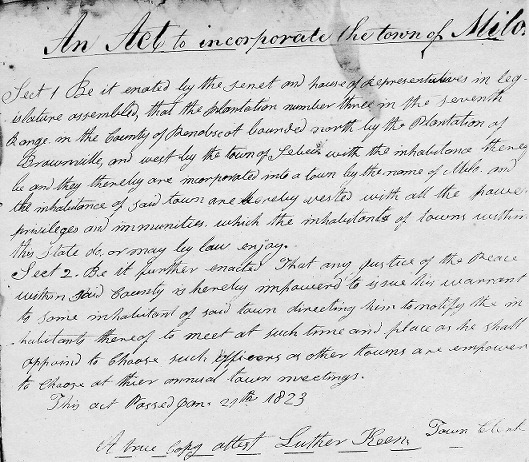 The incorporation of the town in 1823. 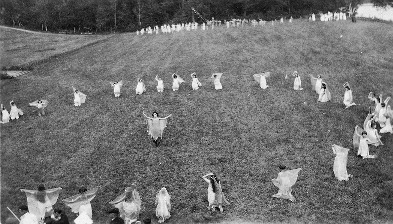 The Birch and Poplar maidens greet the new town in dance. The Milo Light Infantry leaving for the Fall muster at Eli Towne’s, Dover. Education lifts her Torch of Light over the Community. A Spelling Bee in 1859 with Prof. W. S. Knowlton of Monson as teacher. A wedding at the Oriental Hotel 1861. Hannibal Hamlin a guest. The Spirit of Religion joins the Spirit of Education. A church service in 1870. Milo’s Industries: Boston Excelsior Co., American Thread Co., B. & A. Car Shops, Textile Mills Co.
Milo in the World War. SCENE 2. A memorial to the boys who made the Supreme Sacrifice. The book closes. The Spirit of Milo greets the glorious Present with a march of the industries and social activities of the town. From the East comes the Milo of the Future with Industry, Community Co-operation, and Prosperity. She calls the Past and the September sun goes to rest behind the wooded hills with the singing of the Centennial Hymn. Greece, 520 B.C. An Olympian festival where Milo, the famous Greek Athlete, wins the wreath of olives and rides off in a golden Chariod, the victor of the day. Golden trumpeted heralds announce the coming of Father Time and his massive book of 100 years. From out of its weather-beaten pages comes the Spirit of the Three Rivers. She calls the Pines, Birches and Poplars, then the Spring Flowers and rusing through them flow the Three Rivers. 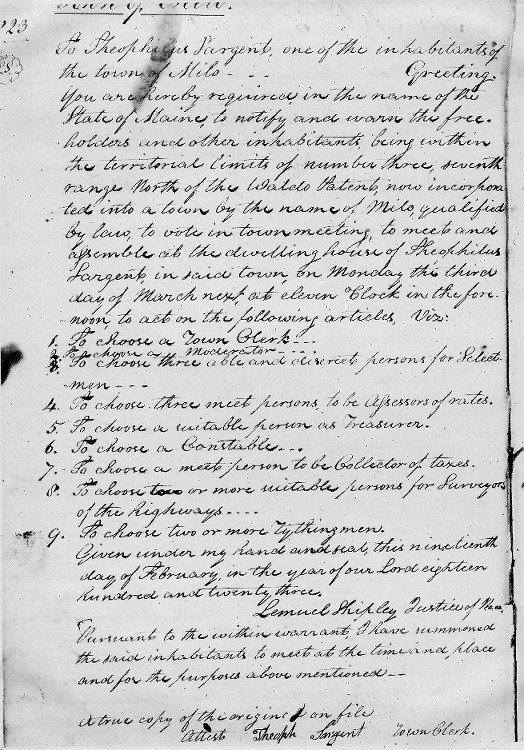 The Penobscot Indians are undisturbed in their annual fishing and hunting trips to this section until the coming of the first white settlers – the Snows and Sargents. 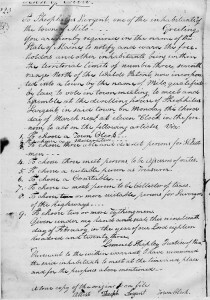 At the same time as the settling of the Snows on the Pleasant River, Benjamin Sargent and his son Theophilus land on the Sebec River. Six months after their arrival Benjamin Sargent starts for Massachusetts, leaving his 14 year old son with the dog Hunter. Meeting of the early settlers in Foxcroft to discuss plans for their protection against Indian invasion. 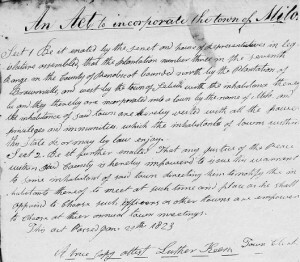 The incorporation of the town 1823. 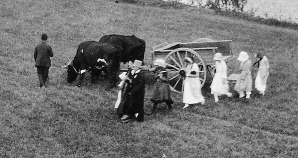 Photographed from 100 year old records in book of Town of Milo – Act of Incorporation. “Fort Sumter is fire upon!” The boys enlist. The Spirit of Religion joins the Spirit of Education. Brought to church by ox-team. Milo’s Industries and the coming of the Railroad. Milo’s Industries – The American Thread Co., Boston Excelsior Co.
Winding the spools and baling the exelsior. Milo’s Industries – Textile Mills Co.
A Memorial Service – Enter America with Victory Palms. Veterans of Civil, Spanish and World Wars, bearing wreaths. The veterans place tributes at the foot of the service flag, America places her palms, and from the West comes France, singing “In Flanders Field” whild she strews the RED POPPY. She calls the Past and the sun goes to rest behind the wooded hills with the singing of the Centennial Hymn. The book closes. The Spirit of Milo greets the glorious Present with a march of the industries and social activities. From the East comes the Milo of the Future with Industry, Co-operation and Prosperity. The contents of this page are from a commemorative scrapbook from the celebration that is posessed by the Society. Special thanks to Seth Barden for scanning it all in!